It's hard to believe the Royal Rumble has been around 30 years. So ahead of next week's show, I came up with some fun facts, mostly about the winners, but I had to stretch on some of them. Most of these I knew, but full disclosure, I had to look some info up. 1989 - "Big" John Studd - Went on to WrestleMania 5 to be a special guest referee and not wrestle. 1990 - Hulk Hogan: First time a WWF Champion won the Rumble. 1992 - Ric Flair: The first heel to win the Royal Rumble and for the first time the WWE Championship was awarded to the winner. 1993 - Yokozuna: First Superstar to win the match under the stipulation that the winner gets a championship match at WrestleMania. 1994 - Bret Hart & Lex Luger: First (and only) co-winners of the Royal Rumble. 1995 - Shawn Michaels: First Superstar to draw number one and win the Rumble. 1996 - Shawn Michaels: Won the match a second time and had the same number of eliminations both years (8). 1997 - "Stone Cold" Steve Austin: First time a Superstar was eliminated from the match and came back to win the Rumble. 1998 - "Stone Cold" Steve Austin: Went toe to toe the night after winning the Rumble with Mike Tyson on Monday Night Raw. 1999 - Vince McMahon - First non-Superstar to win the Rumble. 2000 - The Rock: First time a Royal Rumble winner went on to WrestleMania to face three other competitors for the Championship. 2001 - "Stone Cold" Steve Austin: First three-time winner of the Rumble. 2002 - Triple H: First time the winner challenged for the "Undisputed WWE Championship". 2003 - Brock Lesnar: First winner of the Royal Rumble under a brand split. 2004 - Chris Benoit: Won the Rumble as a SmackDown! Superstart but switched brands to challenge the Raw Champion (Triple H). 2005 - Batista: Won the Rumble and for the first time, the second runner-up challenged the opposing show's champion (John Cena challenged JBL). 2006 - Rey Mysterio: First Superstar under 200 pounds to win the Rumble. 2007 - Undertaker: First Superstar to draw number 30 and win the Rumble. 2008 - John Cena: First time a Superstar no one could see won the Royal Rumble. 2009 - Randy Orton: First time the final two men in the Rumble went on to face each other WrestleMania. Triple H won the WWE Championship the next month at No Way Out in the Elimination Chamber. 2010 - Edge: Up to that time the Superstar who spent the least amount of time in the match to win the Rumble (7:19). 2011 - Alberto Del Rio: First Superstar to outlast 39 other Superstars. 2012 - Sheamus: Yes, Sheamus won. 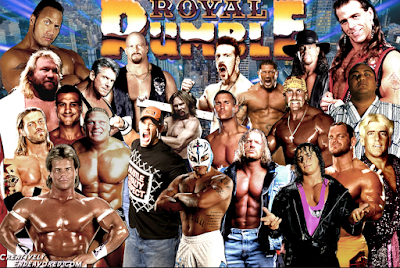 But this marked the first time all three members of the commentary team also competed in the Royal Rumble (Jerry Lawler, Michael Cole and Booker T). 2013 - John Cena: First year an NXT Superstar competed in the Rumble (Bo Dallas). 2014 - Batista: Eliminated Roman Reigns moments after the "Big Dog" set a new record for most eliminations in a single Rumble match (12). 2015 - Roman Reigns: First time a Royal Rumble winner was pinned in the Championship match by a Money in the Bank winner cashing in (Seth Rollins). 2016 - Triple H: First time the WWE Championship was defended in the match. Reigns came in as champ and lost the title that night, only to go on and regain it from Triple H at WrestleMania 32. 2017 - Randy Orton: Announced he was giving up his Championship match after Bray Wyatt won the gold at No Way Out, but it turned out to be a swerve by Orton.